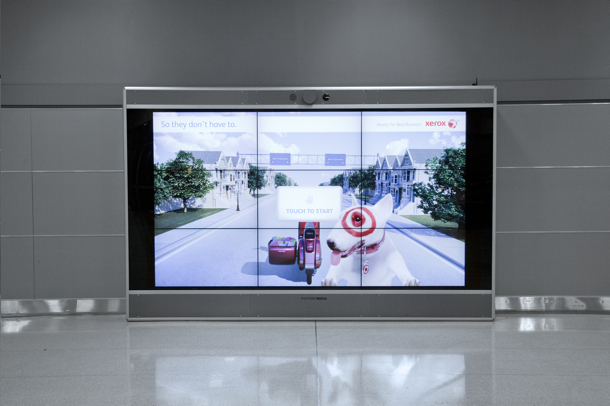 Just in time for what’s bound to be the most irritating travel season ever, Xerox has enlisted Y&R New York and Tronic Studio to mount giant interactive commercials at almost a dozen airports across America. We can’t decide if it’s evil or brilliant or both. 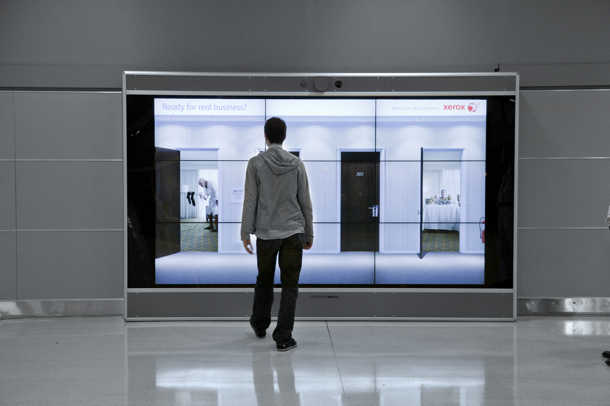 The stations feature Choose Your Own Adventure-style advertisements for Xerox’s b-to-b partnerships with Target and Marriott. So before getting manhandled by some airport security guard who likes his job a little too much, you can settle your nerves in front of a life-sized, nine-screen video display on which you open virtual doors to ogle people in their hotel rooms or “deliver” mail on a motorcycle, with the peppy Target dog in your sidecar. Fun! This is clever marketing. Obviously, turning a billboard into a video game — even one that doesn’t let you blow stuff up — will attract loads of attention, especially at an airport, where entertainment is limited to buying duty-free Kools and watching baggage carriers play football with your luggage. Apparently, the Marriott installation got more than 34,000 hits the first week it went up back in September. So there you go. But man. Doesn’t it feel a little exploitative? Like preying on travelers at their most vulnerable? We totally understand if you’d rather take the bus. The screens are up roughly through November at airports in Atlanta, Boston, Chicago, Denver, Houston, Los Angeles, New York, Philadelphia, and Seattle.